Enjoy sweets, sips and jewels as we network and socialize in the Kendra Scott store. 20% of the proceeds from the jewelry sales that night will be donated back to the Cleveland Professional 20/30 Club. 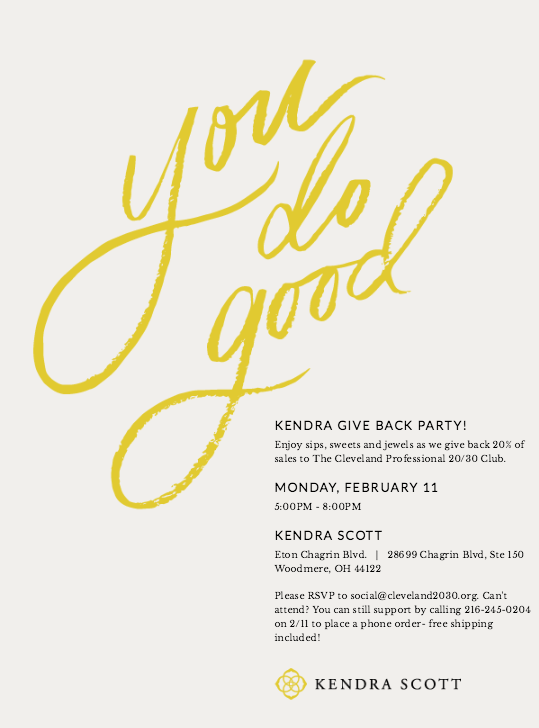 The Kendra Scott store will be providing us some light refreshments and alcoholic beverages as we browse the store. Make no mistake that this event was planned a couple days before Valentine's Day! What a perfect opportunity to buy that special someone a special gift! Also, if you cannot attend this event and would still like to support the cause, call 216-245-0204 to donate. This event is free for Professional and Social members as well as non-members. Registration is recommended.